The Lancashire Fusiliers sent 4000 men to the war in South Africa. The idea of erecting a memorial to fallen did not materialise until 1903 when the plan became public. Initially the plan was to site the memorial in the Market Place next to John Peel. 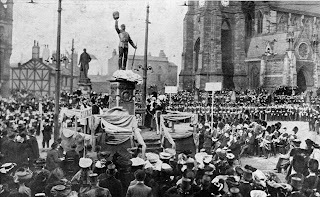 The statue remained in the Market Place until 1920.
memorial. The Robert Peel statue is behind. This will be examined in more detail elsewhere. The wood framed building at the rear is the "Two Tubs" pub. The church is Bury Parish Church. 17th Earl of Derby in March 1905. The statue was moved to its place in Whitehead Clock Tower Gardens in 1920. The design of the cheering soldier was considered radical at the time when the cliché was for soldiers to be in repose or mourning. There is considerably more information at this site. Much research has gone into the detail. Please acknowledge with a link should you use any of this information. Photos used here are mine and copywrite free and may be used - a link would be appreciated. On the actual memorial the letter U is not used. The letter V is used in its place. There are very few instances where it causes confusion. The design of the memorial was by Sir George Frampton, R.A., P.R.B.S. 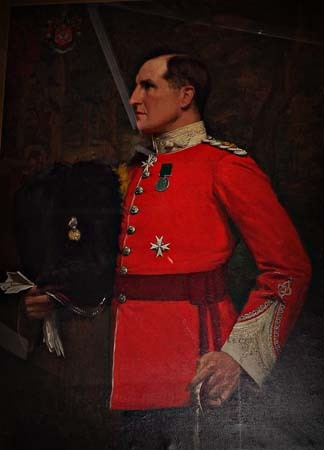 (1860-1928) He liaised with Lieutenant Colonel Sir Lees Knowles M.P. about the design. A lengthy process it was said. He was MP for West Salford. He was appointed Honorary Colonel of the 3rd Volunteer Batallion - The Lancashire Fusiliers in 1899.
and because of his friendship with King Edward VII it was successful. The Fusiliers were honoured with a Primrose Hackle to be worn on the left side of head dress as a Battle Honour. For those interested in Victorian sculpture this link will take you there. Clearly the figure would be controversial - he is a proud soldier, cheering for the King, sorrowfull but proud. He is dressed in the regiments home uniform, rather than that worn by the regiment in which it fought in South Africa. The primrose yellow hackle is visible. The regiment used to march on WhitSunday locally. One of my friends joined up at the very end of the 50's. Got to admit there was a certain feel about "our" regiment and the battle honours that it won. The Whitehead clock is just visible behind. Harry Ibell, he served in the 16th Lancers. This website is not meant to supplant any of the very well, and passionate research out here on the internet. Please read their work. Much of what you read here is on the links. I have drawn it together somewhat. Please use the photos they are mine and copywrite free.